The Uptown Theater was a lavish theater built by the Balaban and Katz theater chain in the 1920s. It had a palatial look and, along with several other theaters in the Chicago area including the Granada a few miles north and the Chicago Theater downtown, were the premier places to see movies in the early part of the 20th-century. However, due to the usual litany of urban decay in the 1970s, crime, poverty and suburban flight, the Uptown Theater and its surrounding namesake neighborhood, Uptown, were quite rundown by the 1970s. Starting in the mid-70s, Jam productions from Chicago starting booking concerts in the venue. They booked many concerts there, including the Grateful Dead, Bob Marley and, of course, Bruce Springsteen and the E Street Band. 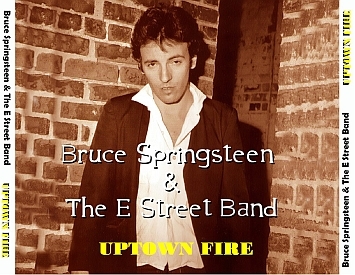 The first time Bruce Springsteen and the E Street band played the Uptown Theater was on September 6, 1978. As my friend and I waited in line for the doors to open in the late summer heat wave, we struck up a conversation with an older man in front of us, wearing a suit that he had probably bought in the 50s or 60s. After a few minutes of speaking with him, we figured out that he did not realize that Bruce Springsteen and the E Street Band were the feature attraction and instead, was waiting in line to see a movie. I’m not sure what he did after we told him the news but I kind of felt sorry for him. For me, the ultimate highlight of the show was “Jungleland.” With its lyrics on urban gang wars, the rough Uptown neighborhood was a perfect setting for it. The line “and the poets down here don’t write nothin’” (by this time, he was leaving the remaining two words of the recorded version, “at all” off the performances) is what I remember most about this performance. 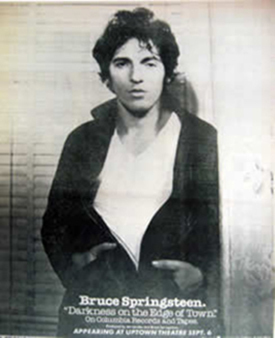 The heat and humidity of the hot summer night filled the theater as Bruce shouted out those lines. The song and performance reflected perfectly the rundown neighborhood, where this rundown theater stood. Though some of the specifics escape me, the overall memory of that hot, September evening many years ago is clear. I am glad that Bruce chose to play the smaller venue rather than one of the city’s arenas. 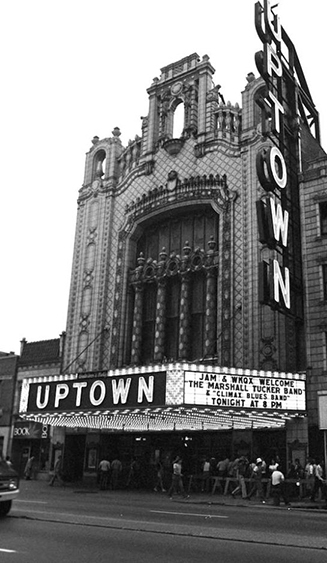 The Uptown Theater has been shuttered since 1981. There is talk of reopening it but like the relentless efforts to revitalize its namesake neighborhood, it can’t quite overcome its storied, yet troubled past. Thanks to the Springsteen fan community for all your support. 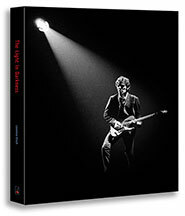 The book The Light in Darkness is now sold out.